Federal mandates aren't often seen as enjoyable or exciting. Maybe it's all that legal lingo, or the fact that they usually don't come bundled with funding. But this one could actually be rather fun. Under two pieces of legislation'the Government Paperwork Reduction Act and the Government Paperwork Elimination Act'agencies are required to move many of their forms to the Web. If a government organization has a single form used more than 500 times a month, it must post that form online, in at least a static, noninteractive format, by the end of the year. By 2003, the agency has to figure out how to automate the processing of such forms. That means a vast array of government paperwork will have to be digitized and made available to the public. The answer is in Web-based forms, looking on-screen like the paper version, capable of being filled out online'or being printed out and completed on paper'with data collectable either from the Web site or by scanning the paper form. Once digitized, of course, it's possible to do a variety of things with the data, such as linking items to databases, processing applications and other forms, and even returning completed items to users via e-mail. Just download and print that permit or hunting license. With a digital signature or another security device, such as a scannable, 2-D bar code, the downloaded version would be just as official as one sent in the mail. That's the general idea, anyway. Such bureaucratic efficiency isn't far away, industry insiders say. The tools for paper-to-digital conversions exist today and are getting better all the time. Exact digital duplication of paper forms brings the transformation to electronic government closer, said Robert Weideman, vice president of marketing at Cardiff Software Inc.
JetForm Design from uses a variety of graphical design tools to allow exact duplication of paper forms. It's priced at $1,495. These advances are being tested. Recently, the Social Security Administration tested a Web system for filing W-2 information with digital signatures. The scenario described by Weideman takes the process a step further by translating usual government paper transactions into electronic ones. Key to the process is using the Adobe Portable Document Format as the conversion method for bringing paper forms to the screen. PDF, first introduced in 1993 along with the Adobe Acrobat Reader, is practically a de facto standard for electronic paper. Some 160 million copies of the firm's free Acrobat Reader software, which lets users view and print .pdf files, have been downloaded or installed by computer users. The ability to fill in PDF forms is relatively new, coming with the release last year of Acrobat 4.0. Along with the form-filling capability, Adobe is offering a 'platform agnostic' means to process data collected on Web forms, said David Baskerville, a product manager in Adobe's e-paper solutions group. Adobe is licensing form-filling technology to organizations such as the IRS, whose Web site, at www.irs.gov, contains a database of forms that can be completed online. The company also includes the technology in the $79 Acrobat Business Tools software and the $249 full version of Adobe Acrobat 4.0. Digital signature. A digital signature encodes an electronic document with an encrypted, unique signature that positively identifies the person who applied the signature. Digital signatures can be implemented as a standalone tool or integrated into enterprise networks. ODBC. Open Database Connectivity is a standard database access method developed by Microsoft Corp. The specification makes it possible to access any data from any application, regardless of which database management system is handling the data. PDF. Portable Document Format, introduced by Adobe Systems Inc. in 1993, enables the exact electronic representation of a paper form. Since last year, the format has included the ability to fill in forms data, which can be exported to various formats. XML. Extensible Markup Language is based on Standard Generalized Markup Language and is being developed for use in Web documents. XML can sidestep the proprietary tags of Hypertext Markup Language by allowing customized tags created according to XML rules. XForms. A standard being developed by the World Wide Web Consortium, XForms separate a form's purpose and presentation with two specifications: data model and user interface. The data model allows the abstract structure of a form to be defined without explicitly specifying a user interface. More information can be found at www.w3.org/MarkUp/Forms. 'The advantage that doing forms in PDF brings is that the look and feel of the form as it existed on paper can be perfectly maintained within the Web browser,' Baskerville said. Baskerville said the PDF approach also can let users design forms'such as an expense report'that can be signed and approved by multiple parties and processed electronically. Cardiff's Weideman added that with the technology used for digitally signing an expense report, it's possible to design a form that can be locked down in stages, meaning entries cannot be changed after the form is signed. The same security measure can apply to other approval steps in the process. Cardiff's PDF+Forms Forms product, which starts at $4,995, offers numerous features to create forms and utilize their data. The program offers a point-and-click forms designer, the ability to submit data online, rules-based processing of data on the server and connections to any database that might reside on a server via Open Database Connectivity as well as native support for Microsoft Access and Excel. The software can automatically convert data into Extensible Markup Language data streams that support programs such as Microsoft BizTalk and other XML schema systems. Finally, the program offers the ability to archive completed forms into Web content management systems from vendors such as FileNet Corp. of Costa Mesa, Calif., and OpenText Corp. of Waterloo, Ontario, as well as Microsoft Outlook and Exchange, and Lotus Notes and Domino. Weideman maintains that the consistency between paper and online forms offered by PDF is vital to achieving this kind of integration. HTML form designers exist, but tend to produce forms in varying layouts. Not only will it be possible for forms collection to be automated, he said, but ultimately a preliminary step can be returned to users in a different format. Instead of sending selected homes a long census form, he said, the Census Bureau, which uses Cardiff products, could process short forms via the Web and then mail long forms that have the basic information already completed. 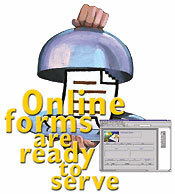 Agencies have started making use of electronic forms. Weideman said the Bureau of Labor Statistics uses the forms software to create and distribute pricing surveys used in computing the Consumer Price Index. The Centers for Disease Control and Prevention in Atlanta uses it for field survey data on tainted water and West Nile virus outbreaks, while the Food and Drug Administration employs the software for seafood inspections. Among the things these applications have in common are tight time requirements. Over the next year, one of the key developments in Web forms will be the implementation of XML standards. According to Weideman, the pending Xform standard'being developed by the World Wide Web Consortium, a trade group'will help in that situation. 'XML is no different at 30,000 feet than Java; it's a standard language. You can use XML to build open products or proprietary implementation of products,' he said. 'In the electronic forms space, Xforms is an effort to make an open standard. That will change, he said, when the standard is adopted and implemented.